Quality extras like triple bar tacking on the handle and buckle bumpers to prevent damage to your case. The harness is designed to be left on the computer during operation. This is perfect for students, technicians and gamers who need to move their computers. 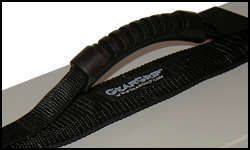 The harness has a depth of 12" (front to rear). This may be too large for some super mini computers.